Elegant leather-look. Available in either black or dark brown. 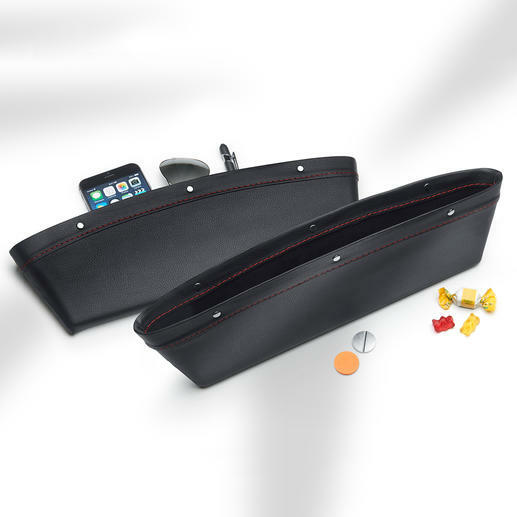 Elegant car seat-gap bag to keep small things safe and to hand, eliminating the hassle of searching and dangerous distractions. Smartphone, wallet, keychain, ... Instead of lying loose in the passenger seat, these small items are now stored safely and within reach in this elegant seat-gap organizer. Even with an emergency stop, they won’t fly dangerously through the car. And what’s even more ­ingenious: Nothing can fall through the narrow seat gap anymore, saving you the hassle from getting it out again. Also, sweet wrappers, crumbs etc. are collected so your car stays clean. Easily removable for cleaning. Wipe clean with a damp cloth. Made of high-quality faux leather with a grained look, carefully and robustly sewn. Size 34.5 x 11 x 4cm (13.6" x 4.3" x 1.6") (W x H x D), weight 180g (6.3 oz) each. 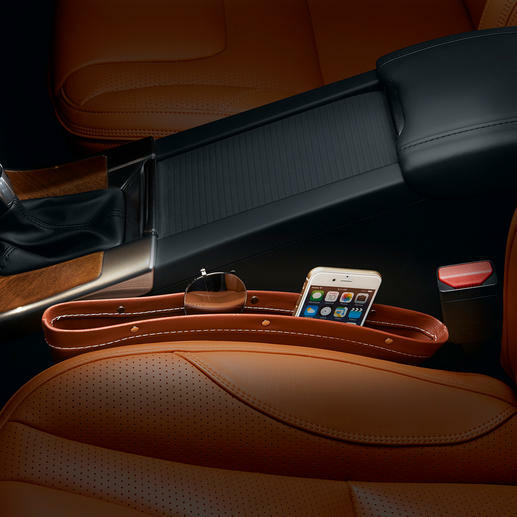 A handy accessory in the car. Also prevents things from falling between the car seat and central console.